The Onyx Mallet is a Physical type weapon. The Onyx Mallet Trap represents the latest and greatest achievement in pulverizing technology. Unequaled in the making of such items as puree of mouse, mouse tartar and, the ever popular Mouse Paste, the Onyx Mallet is quickly becoming a favorite among those discerning individuals who insist on receiving their mice flat. Simply place the cheese below the mallet, set the arm to the ready position, and listen for the splat. 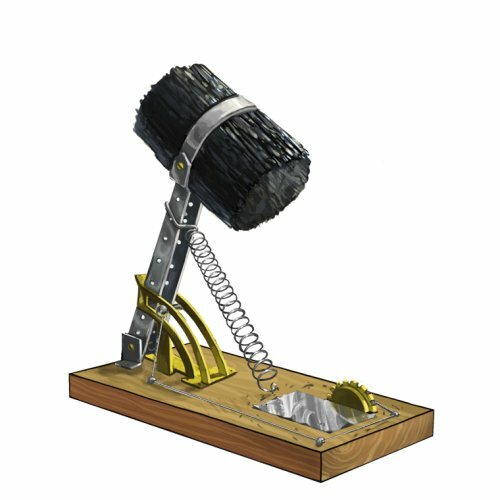 The Onyx Mallet is not sold by any Trapsmith. It can only be crafted given the proper ingredients. Hunters must have the rank of Grandmaster or better to craft the Onyx Mallet. 9 March 2010: The Onyx Mallet was introduced when the Dojo Sensei began dropping the blueprints. This page was last edited on 13 January 2019, at 13:25.